CAN YOU HANDLE THE TRUTH? 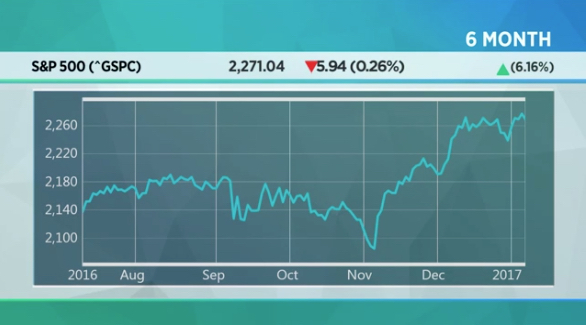 Here it is..
Peter Eliades of Stockmarket Cycles, returns with a warning for US equities investors. Despite the recent advance, his technical cycles work predicts a possible market peak. If the advance / decline line fails to confirm a retest of the zenith, a decade long stock bear could emerge from the 8 year slumber. A key component of his analysis includes his three decade cycle that seems to confirm his equities market top thesis. Peter Eliades notes in a recent interview that gold represents real wealth. Gold's robust rally paused for just long enough on Wednesday to discourage bulls — including your editor, who had advised a long position in GDX with a stop-loss far more generous than is typical for a Rick's Picks trade. Unfortunately, it wasn't generous enough to weather the gratuitous swoon shown in the chart (see inset), although it did leave the 1210.50 rally target we'd been using intact. I've lowered the target slightly, to 1209.80, to conform to a 'one-off' low at 1147.20 that looks likely to produce a more accurate short-term top. On January 3, 2017 Ford Motor Company backed away from plans to build a $1.6 billion assembly plant in Mexico and instead opted to add 700 jobs at a Michigan plant. This abrupt reversal followed sharp criticism from Donald Trump. Ford joins Carrier in reneging on plans to move production to Mexico and will possibly be followed by other large corporations rumored to be reconsidering outsourcing. Although retaining manufacturing and jobs in the U.S. is a favorable development, it seems unlikely that these companies are changing their plans over concerns for American workers or due to stern remarks from President-elect Trump. What does seem likely? Big changes in trade policy occurring within the first 100 days of Trump’s presidency. The change in plans by Ford and Carrier serve as clues to what may lie ahead and imply a cost-benefit analysis. In order to gain better insight into what the trade policy of the new administration may hold, consideration of cabinet members nominated to key positions of influence is in order. Peter Navarro is a business professor from the University of California-Irvine. Mr. Navarro has been very outspoken about China and the need to renegotiate existing trade deals in order to put America on a level playing field with global manufacturers. The author of the book, “Death by China”, will lead the newly created White House National Trade Council. Wilbur Ross is a billionaire investor who made his fortune by resurrecting struggling companies. In the words of Donald Trump, Mr. Ross is a “champion of American manufacturing and knows how to turn them around”. The long time trade protectionist will now serve as Commerce Secretary. Robert Lighthizer is currently a lawyer with a focus on trade litigation and lobbying on behalf of large U.S. corporations. Earlier in his career, he served as deputy U.S. Trade Representative under President Ronald Reagan. Mr. Lighthizer has been very outspoken about unfair trade practices that harm America. In his new role he will serve as Trump’s U.S. Trade Representative. Donald Trump said that Mr. Lighthizer will work “in close coordination” with Wilbur Ross and Peter Navarro. The bottom line is that these three advisors have strong protectionist views and generally feel that China, Mexico and other nations have taken advantage of America. These four proposals and other trade-related rhetoric that Donald Trump repeatedly stated while running for president suggest that he will take immediate steps to level the global trade playing field. At this point, it is pure conjecture what actions may or may not be taken. However, the article, “We need a tough negotiator like Trump to fix U.S. trade policy”, penned by Peter Navarro and Wilbur Ross from July 2016 offers clues. In the article, Navarro and Ross took the World Trade Organization (WTO) to task for being negligent in defending the United States against unfair trade. Additionally, they note the WTO “provides little or no protection against four of the most potent unfair trade practices many of our trade partners routinely engage in — currency manipulation, intellectual property theft, and the use of both sweatshop labor and pollution havens”. Although it remains unclear which approach the Trump trade team will take, much less what they will accomplish, we are quite certain they will make waves. The U.S. equity markets have been bullish on the outlook for the new administration given its business friendly posture toward tax and regulatory reform, but they have turned a blind eye toward possible negative side effects of any of his plans. Global trade and supply chain interdependencies have been a tailwind for corporate earnings for decades. Abrupt changes in those dynamics represent a meaningful shift in the trajectory of global growth, and the equity markets will eventually be required to deal with the uncertainties that will accompany those changes. If actions are taken to impose tariffs, VATs, border adjustments or renege on trade deals, the consequences to various asset classes could be severe. Of further importance, the U.S. dollar is the world’s reserve currency and accounts for the majority of global trade. If global trade is hampered, marginal demand for dollars would likely decrease as would the value of the dollar versus other currencies. Investors should anticipate that, whatever actions are taken by the new administration, America’s trade partners will likely take similar actions in order to protect their own interests. If this is the case, the prices of goods and materials will likely rise along with tensions in global trade markets. Retaliation raises the specter of heightened inflationary pressures, which could force the Federal Reserve to raise interest rates at a faster pace than expected. The possibility of inflation coupled with higher interest rates and weak economic growth would lead to an economic state called stagflation. Other than precious metals and possibly some companies operating largely within the United States, it iummaryc or global assets that benefit. d to envision other assets lation, higher interest and stagnant economic growth would lis hard to envision many other domestic or global assets that benefit from a trade war. We like to think that the lessons from the Great Depression would prevent a trade war like the one precipitated by the Smoot-Hawley Tariff act. We must realize, however, that nationalism is on the rise here and abroad, and America will soon have a president that appears more than willing to take swift and aggressive action to ensure that it is not taken advantage of in the global trade arena. It is premature to make investment decisions based on rhetoric and threats. It is also possible that much of this bluster could simply be the opening bid in what is a peaceful renegotiation of global trade agreements. To the extent that global growth and trade has been the beneficiary of years of asymmetries at the expense of the United States, then change is overdue. Our hope is that the Trump administration can impose the discipline of smart business with the tact of shrewd diplomacy to affect these changes in an orderly manner. Regardless, we must pay close attention as trade conflicts and their consequences can escalate quickly. Trump's press conference was a damn squib. It was hawkish with no solid information on future policy. This resulted in gold's rise and a fall in the US dollar. Attack of pharma companies and separation of his business interests and the Mexico wall also did not go down well with traders and investors. There are also issues over US senate clearance of Trumps cabinet. Lack of clarity over key issues has resulted in gold rising. It is difficult to say exactly how, or when, the next collapse will be triggered, but, as SHTFPlan.com's Mac Slavo notes, of course all the conditions are ripe for it. What can be certain is that the technocrats intent on controlling the future are already engineering the post-collapse society. Many of the Davos elite have been pushing “universal basic income” for all countries across the globe, and are leading people not only into a digital grid where cash is banned, but also into a society where private property and ownership are outlawed. They are designing a future in which you must borrow or rent everything you need from corporations or the government, if you are allowed to have them at all. You Realize The Universal Basic Income Is Feudalism, Right? What does the future hold for average people? And they’ll welcome it with open arms, convinced that they are embracing a smart, fair system that eliminates poverty. The greed, entitlement, and lack of ambition that seems inherent in many people today will have them slipping on the yoke of servitude willingly. But the thing is, what we “deserve” is the right to pursue our dreams freely. We deserve what we earn. We deserve to be secure in our life, liberty, and property. We deserve the freedom to go about our lives and decisions as long as we aren’t harming the life, liberty, and property of others. No one owes us anything other than that. But quite a few people are ready to give up their freedom so that someone else can take care of them. A lot of people disagree with that list of rights. The idea of a universal basic income for all citizens has been catching on all over the world. Is it too crazy to believe in? We spoke to the author of a new book on the ins, outs, and utopian dreams of making basic income a reality.The basic income movement got a significant boost this week when the charity GiveDirectly announced that it will be pursuing a ten-year, $30 million pilot project giving a select group of Kenyan villagers a basic income and studying its effects. As an anti-poverty solution, universal basic income appeals to impoverished people in Africa, relatively well-off Scandinavians, and Americans automated out of their jobs alike. Sure, money for nothing sounds great on the surface. But what would the real result of a Universal Basic Income be? UBI would fast track us back to the feudalism of the Middle Ages. Sure, we’d be living in slick, modern micro-efficiencies instead of shacks. We’d have some kind of modern job instead of raising sheep for the lord of the manor. But, in the end, we wouldn’t actually own anything because private property would be abolished for all but the ruling class. We’d no longer have the ability to get ahead in life. Our courses would be set for us and veering off of those courses would be harshly discouraged. People will be completely dependent on the government and ruling class for every necessity: food, shelter, water, clothing. What better way to assert control than to make compliance necessary for survival? Here’s a quick glimpse at peasant life in the Middle Ages, for comparison’s sake. The period of history from the 5th to the 15th century was known as the Middle Ages. During this time, the law of the land in Europe was the “feudal system.” This system was the manner in which the upper 10% (the nobility) controlled the lower 90% (the serfs or peasants). It is estimated that just over 90% of the population of Europe were peasants. Most peasants were basically slaves. They were provided with a small shelter on an inferior piece of land and the “protection” of the noble in charge of that area. In return, they worked for the estate, farming the land with no recompense, paying taxes and having no control over their lives. Some peasants were “free” and had small businesses: blacksmiths, carpenters, bakers, etc. They paid for the protection of the “Lord” with money, goods, and services. Each year, the peasant was required to give the best part of his harvest to the lord of the manor. The peasants were not allowed to own things that made their lives easier, like oxen or horses, for example. A peasant did not own the land on which he lived and was therefore obligated to live where he was told, grow what he was told, and farm in the manner in which he was told. They were not allowed to hunt on the lord’s land – poaching was an offense punishable by death. They were not permitted to cut trees for firewood but forced to gather fallen branches to stay warm. A peasant was not allowed to have real, effective weapons – those were reserved for the armies of the nobility, to keep the peasants in line and immediately quell any quest for dignity and independence. People will be trapped into servitude because they feel entitled to a lifestyle. Over the past years, the education has drummed a sense of entitlement into students. And now, world leaders are counting on using that feeling of entitlement to march society willingly right into a tiny gilded cage. The World Economic Forum is held yearly in Davos, Switzerland. It is at this meeting where a couple thousand of the world’s top economic and political leaders meet to plot our future. If you think I’m crazy for the comparison between UBI and serfdom, wait until you see this year’s vision for our future. In her article, Auken idealizes feudalism, and the kinds of people who believe they “deserve” certain entitlements, like the UBI will welcome this loss of individuality and freedom with open arms. Watch the video below. I couldn’t make this up if I tried. For more information about a futuristic feudal society, watch the documentary Obsolete, available for free with an Amazon Prime membership. 2016 was a record breaking year for the city of Chicago, unfortunately just not in any positive ways. Throughout 2016 we noted several grim milestones that plagued the Windy City: the deadliest month in 23 years, the deadliest day in 13 years, 4,300 people shot...the list goes on and on. And, as we noted a couple of weeks ago, when it was all said and done Chicago was thought to have recorded around 762 murders in 2016 (see "Chicago Violence Worst In 20 Years: 'Not Seen This Level Of Disrespect For Police Ever'"). To put those numbers into perspective, Chicago recorded over 20% more murders in 2016 than New York and Los Angeles combined, despite having a fraction of the population. And as bad as all those figures are, according to the Cook County Medical Examiner's office, the actual number of homicides recorded in Chicago in 2016 were even higher than the official police data would suggest. The discrepancy is largely due to the fact that the Medical Examiner's office tallies "homicides" while the official police data tracks "murders," which exclude intentional killings that are deemed "justified" (e.g. police shootings). So while the official police data suggests there were 762 murders in 2016 the county numbers reflect 812 homicides including all of the "justified" killings. The record-setting violence in Chicago is even worse than announced as new evidence shows the city suffered 50 more homicides last year than the numbers publicly reported in the past week. The city posted a decades-high homicide count of 812 in 2016, per the Cook County Medical Examiner's office. That's 15% greater than the 762 murders reported by the city's police department. The discrepancy is largely due to the fact that the county tallies "homicides" while the police number counts "murders." Murders are defined as violent acts subject to criminal prosecution. Homicides, according to the medical examiner, include instances "when the death of a person comes at the hand of another person. This does not imply that all homicides are murders that would be subject to criminal prosecution." The city police count is also lower because it excludes violent, intentional deaths if the act is deemed justified, including police killings of residents. Meanwhile, the overwhelming majority of Chicago's homicides came a result of gunshot wounds while ~80% of the victims in Cook County were African American. Gun violence is the leading cause of death for victims of homicide in Chicago with 725 decedents being felled by at least one gunshot wound. African Americans also bore the brunt of the violence in Cook County, which includes Chicago. They accounted for 710 of the county-wide total of 915 (88% of which occurred in the city). Men comprised 90% of the homicide victims in the county. And while we would like to hope the recent data points to a less violent 2017, the collapse in shootings seems to be perfectly correlated with a 5-day period of frigid temperatures that likely kept Chicago's violent youth indoors for a few days. So let's imagine a scenario in which tens of trillions of at-risk wealth suddenly seek an alternative--any alternative to staying in an asset class that's circling the drain. As my colleague Davefairtex observed recently, the paint isn't quite dry on bitcoin and the expanding host of other cryptocurrencies. Initial enthusiasm for the latest cryptocurrency that's going to eat bitcoin's lunch generates outsized returns for early investors, but as glitches in the vision arise, the bubble of initial euphoria pops. Differing visions of bitcoin's future have divided its community of participants and miners, and hard forks have split other cryptocurrencies into competing camps. Meanwhile, the spectre of outright bans on bitcoin and cryptocurrencies by nations such as China adds uncertainty to the entire sector. Many observers expect that China's increasingly pervasive attempts to staunch the flow of capital out of China via capital controls will lead inevitably to strict limits on bitcoin or even a total ban on bitcoin transactions and mining in China. Since the majority of mining and transactions occur in China, severe limits or a ban would have an outsized impact on the bitcoin community. Many observers foresee the potential for a massive decline in the price of bitcoin should such a ban be imposed. As if all these issues didn't generate enough uncertainty and skepticism, it seems as if every time the general public starts getting interested in cryptocurrencies, another exchange is hacked or another entry in the cryptocurrency sweepstakes blows up, sending the sector back into the "untrustworthy" abyss. But this minefield shouldn't blind us to the possibility of a path to $10,000 bitcoin. Skepticism is always prudent in any financial matter, especially a speculative one, so put on your skeptical thinkijng cap and follow along. The problem is everything is now speculative. Do you really think the $100 trillion private-sector bond market (i.e. the bet that debtors will pay back what they borrowed with interest) is "safe," as in guaranteed, bullet-proof, no serious loss of capital is possible, etc.? How about the $60 trillion sovereign (government) bond market? The problem with sovereign bonds is governments with central banks can create "money" out of thin air to pay interest and redeem maturing bonds, but this devalues the currency. So getting back 100% of your nominal investment doesn't mean you're whole; if the currency the bond is denominated in fell 50%, bondholders suffer a 50% loss in the purchasing power of their initial capital. Ouch. How is that not speculative? 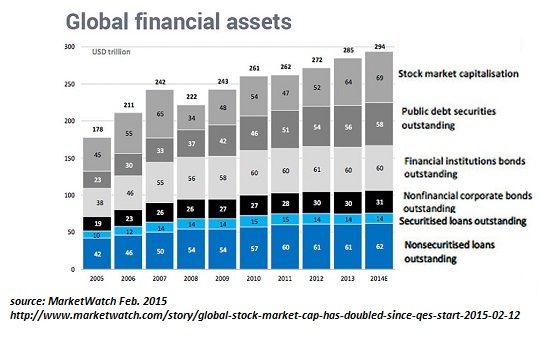 How about the $70 trillion in global stocks? Yes, we all "know" that stocks will never go down ever again because central banks can keep inflating new credit bubbles indefinitely--but let's not kid ourselves: history tells us that stocks remain a speculative gamble. How about the $62 trillion in unsecuritized debt instruments? How much of this debt is collateralized by fast-dying malls, bubble-priced real estate, or Unicorn-type valuations in other assets? Take a gander at this chart of financial assets, roughly $300 trillion, and note that this doesn't include real estate, housing, etc. Global real estate is estimated at $217 trillion, roughly two-thirds of financial wealth. Together, these assets add up to over $500 trillion. Once again, the larger context here is: all these assets are speculative. Yes, even real estate. Consider this, if you missed it: When Assets (Such as Real Estate) Become Liabilities. Then there's the currency market. Care to argue that currencies are non-speculative investments? Is that why Chinese wealth is gushing out of the yuan, because it's so guaranteed to never lose purchasing power? Is that why the euro fell from 1.40 to 1.05, because it's a guaranteed safe investment? Venezuelans learned the hard way that fiat currencies when mismanaged by the issuing nation/central bank can destroy wealth on an unimaginable scale. So now let's turn to bitcoin, with a market cap of about $14 billion, down from a recent high of $18 billion. Now compare that to $500 trillion. If we take 1 measly little trillion, bitcoin's entire market cap is 1/70th of that. So let's imagine a scenario in which tens of trillions of at-risk wealth suddenly seek an alternative--any alternative to staying in an asset class that's circling the drain. We're accustomed to "rotation," the nice little game where bonds can be sold and the capital invested in real estate or stocks, or vice versa. We're less accustomed to all the conventional asset classes toppling like dominoes. Where do the fleeing trillions go when stocks, bonds and real estate are all going down in a chaotic sell-off? Gold and silver are time-honored safe havens, but it's not too difficult to foresee the potential for limits or bans on gold, or supply constraints. Some percentage of investors will consider alternatives. In such an environment of a crowd rushing for increasingly narrowing exits, what thin slice of institutional and individual investors will take a chance that bitcoin might hold or even increase its value as a major currency melts down, or some other global financial crisis unfolds? Shall we guess 1/10th of 1% of the panicky fleeing wealth will take the chance that bitcoin will be a safer haven than the conventional assets that are cratering? So 1% of the $300 trillion in financial assets (setting aside the $200 trillion in real estate for the moment) is $3 trillion, and a tenth of that is $300 billion. So what happens to bitcoin's price if $300 billion rushes through the wormhole? On the face of it, market cap would go up 20-fold from current levels. Since the number of bitcoin is limited to around 18 or 19 million (subtracting those bitcoin lost forever to hard drive crashes, etc., and those yet to be mined), price would also have to rise 20-fold. OK, so 1/10th of 1% of global financial wealth flowing into bitcoin strains credulity. Let's make it 1/20th of 1%, or $150 billion. That still pushes bitcoin's market cap and price up 10-fold. That's the pathway to $10,000 bitcoin. Unlikely, you say? Perhaps. But if you're of the mind that $500 trillion in current assets might be revalued considerably lower in a global crisis, then a tiny sliver of that fast-evaporating wealth finding a home in bitcoin (or other cryptocurrencies) doesn't seem all that farfetched. You want farfetched, how about $3 trillion in panicky fleeing capital flooding into bitcoin? Yes, a whole, gigantic, enormous 1% of speculative financial "wealth" and "money" seeking a home in cryptocurrencies. Cryptocurrencies are intrinsically volatile and speculative. Anyone pondering them must keep this firmly in mind at all times. There is no "guaranteed" safety or guaranteed anything. Everything that appears solid can melt into thin air (to borrow Marx's phrase) without advance notice. How Much Gold Do Central Banks Actually Have? Disclosure: the author has a tiny speculative position in bitcoin. This is not a recommendation to anyone to speculate in any financial instrument, including cryptocurrecies. Please read the site's full disclosure here: HUGE GIANT BIG FAT DISCLAIMER. Gold edged up to $1191.26 in Asia before it fell back to $1177.25 in midmorning New York trade, but it then jumped to as high as $1198.13 in early afternoon trade and ended with a gain of 0.31%. Silver slipped to $16.534 before it rallied back to $16.86 and then fell back off into the close, but it ended with a loss of just 0.36%. This post Nomi Prins: More Corporate Defaults, Central Bank Desperation in 2017 appeared first on Daily Reckoning. Nomi Prins joined Yahoo Finance and The Final Round's Jen Rogers to discuss the events facing 2017 – including increased corporate defaults, market volatility and the impact of oil under Rex Tillerson at the U.S State Department. When posed the question about economic growth and the incoming Trump administration Prins did not mince words saying, "Ultimately what is going to happen is he's not going to be able to push a "mega fiscal budget" through a Republican Congress, nor will he try. Nor will he be able to sustain the kind of growth that he has promised. There may be a PR element, but in terms of actual conversions and the practical realities of the economy, that was weak to begin with for so many people, that's not going to be a reality. That is going to take its toll on not just our stock market, but will add uncertainty into the rest of the world that is looking at these expectations." Nomi Prins is the best selling author of All the Presidents' Bankers and is currently working on her latest book, The Artisans of Money. Prins is a former Managing Director at Goldman Sachs and worked at an array of the most influential Wall Street banks. She continues to be a strong advocate for a modern Glass-Steagall Act and breaking up big bank institutions that pose a threat to the global economy. When asked about the outlook for the Fed, growth projections, and whether the U.S central bank will have to get ahead of inflation she responded, "We have had a price inflation, in terms of the cost of living, but we haven't had inflation in terms of the areas that the Fed actually measures. What was interesting about when the Federal Reserve raised rates in December, which had been done a year earlier in December as well, was that they projected last year (after examining what they're looking at for forecasts based in growth and the economy) four rate hikes, we got one. This year they have only projected three. In effect the status on their own projections is actually more accommodative than it was the year before." "In the year before the markets opened up in January with a lot of falls. That was when we saw other central banks around the world, in particular the Bank of Japan and the European Central Bank, come in and reduce their rates to equate all of the costs of money globally back at zero. This was done to balance against the Fed's hike." Switching from central bank policy to advising people to remove themselves from financial institutions Prins' remarked, " (People must be prepared) In the event of a separate financial crisis of any kind. There are issues that have still not been cleaned up in the financial sector, that is built on codependency between banks, and we could see a lot more of what has happened in Cyprus and Venezuela come into core markets. This would require banks to "batten down the hatches" on the liquidity they give to their customers, particularly if they are concerned about liquidity or credit problems. "Corporate defaults are rising and occurring in the markets to which they lend. In that event, it is better to have more cash out of accounts that are effectively receiving zero interest rates, or close to zero, anyways. They could use that to buy hard assets, to pay down certain debts and to maintain as more liquid as individuals in terms of money on hand, as opposed to money in a bank." 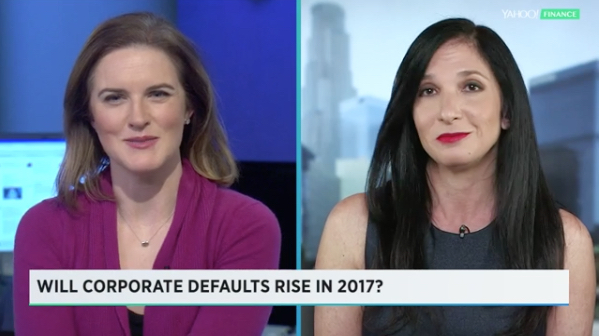 The Yahoo Finance host then asked why she saw the trend of corporate defaults continuing in 2017, "First, last year was a bad year. It was 40% worse than it had been the year before. So we are inching up toward the number of medium and longer term corporate defaults that we had during the worst year of the crisis." She went on to remark, "that will continue, not least because of where oil prices are. Oil streams from a lot of what caused, and is still causing, some of these defaults. In the instance that Rex Tillerson is to become Secretary of State, he holds a policy to drill and increase supply. That is not necessarily going to impact the price of oil, which may continue to hurt that segment of the market, and other outlying sectors that rely on corporate defaults." "The trajectory for 2017 is likely to continue, and if the U.S dollar stays the strong and rates stay where they are, where the Fed doesn't increase interest rates – we will be looking at international defaults. These international corporate defaults have also been increasing, while countries have to pay higher costs of their dollars." To catch the full interview with Nomi Prins on Yahoo Finance covering greater corporate defaults in store for 2017 and what is on her financial road map, Click Here. The post Nomi Prins: More Corporate Defaults, Central Bank Desperation in 2017 appeared first on Daily Reckoning. By Olivier Garret : Gold prices have dropped from $1,340 an ounce in September to around $1,130 as of this writing. The cause is the strengthening USD and the recent rally in the US stock market that followed Trump’s surprise victory. Plus, most people now expect at least a few rate hikes by the Fed. Gold rarely fares well in a rising real rates environment. Many investors wonder if gold has entered a lasting bear market. Or if this is the time to buy while prices are low. Twenty-two radio interviews for the new book, 10 of them live. At this point, my voice is tired. So are gold sellers. Gold peaked at $1,934 in September of 2011 – the last major commodity to peak in the 30-year cycle that first peaked in mid-2008. Gold Bars Worth $800,000 Owned By Prince Prince, RIP, owned gold bars worth just over $800,000 according to the statement filed in a Minnesota court last Friday. At the time of his death, Prince had taken delivery of and had in his possession 67 gold bars, 10 ounce gold bars, valued at $836,166.70. That’s according to an asset inventory compiled by Bremer Trust released by the Carver County District Court, as first reported by the Minneapolis Star Tribune.